Do you know how many bridges are in the world? There are 590,111 bridges in the U.S. alone. But there are no statistics on how many bridges are in the world. If the U.S. is anything to go by, it’ll be a huge number! Whether it’s a tiny wooden bridge over a bubbling stream or a huge suspension bridge towering over a major city, there’s something fascinating about bridges. Can’t “get over” your bridge obsession? Check out these famous bridges from around the world that you’ve got to add to your bucket list. There are many famous bridges in the U.S. and hundreds of others around the world. Each bridge is unique, and each view is individually fantastic. Check out eight of our favorite bridges worldwide! 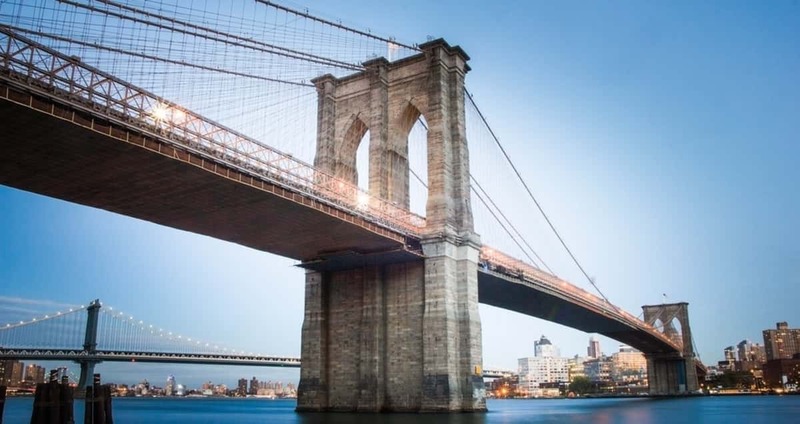 Let’s kick off with one of the oldest and most famous bridges in the U.S., the Brooklyn Bridge. Builders completed its construction in 1883. Since then, it has been featured in almost every movie or TV show based in New York. The wide pedestrian walkway makes it a popular bridge to stroll or cycle across. Many tourists make this part of their tour itinerary when they visit New York. But it’s not only pedestrians and cyclists meandering across. About 150,000 vehicles cross the bridge daily! That’s a drastic change from when streetcars and horse-drawn carriages were the main forms of transport. Langkawi Sky Bridge in Malaysia is one of the most famous bridges in the world. It dangles 2,300 feet above sea level and boasts breathtaking views and a spine-tingling adrenalin rush! More like an observation deck than a practical bridge, tourists reach it by taking a cable car ride. The views are impressive, but the engineering is even more so. The support of the bridge is a single pylon that sticks up from the mountain below. One of the most recognizable bridges around the world is the Sydney Harbour Bridge. The world-famous bridge in Australia opened in 1932. Whether day or night, almost every tourist has to take a walk over this iconic bridge. City views are spectacular from all angles, with the southeast pylon offering a lookout point over the magnificent harbor. If walking doesn’t do it for you, you can even climb it. Climbing the Sydney harbor bridge might be one of the most exhilarating bridge walks in the world. You have to get strapped in, and professionals will assist you while you traverse the three-hour walk over the upper arch. Now let’s cross to the other side of the planet and see a one-of-a-kind tilting bridge in the UK. Out of all the bridges around the world, the Gateshead Millenium bridge has a unique ingenious design. In fact, it’s the only tilting bridge in the world so far. This structure looks super high-tech with its futuristic design. But it’s the tilting mechanism that makes it so special. When a boat needs to pass underneath, the bridge uses its powerful electric motors to tilt. The bridge also has a secret eco-friendly mechanism as it can clear up its own trash. If people drop litter on the deck, it automatically rolls into traps at both ends. On June 28, 2001, about 36,000 people lined the river banks to watch the bridge tilt for the very first time. Since then, crowds of onlookers visit each year to enjoy this sight. Any San Fransico based movie you watch starts with a panoramic view of the Golden Gate Bridge. It’s one of the most famous bridges in the U.S. and many believe it’s the most photographed structure of its kind in the world. The bridge spans over the San Fransico Bay into the Pacific Ocean. The 1.7-mile long red structure became complete in 1937. It’s 750-foot high and can definitely get your heart racing if you take a peek over the railing. It takes about an hour to walk the length of the bridge. But it’s only open for pedestrians and cyclists in the daytime. If you move away from city life and step into Vancouver’s lush treetop ecosystem, you’ll find a masterpiece of a bridge. This structure is 450-foot-long and floats 230 feet above the Capilano River. The wobbly bridge dates all the way back to 1889 when a Scottish engineer made a rudimentary rope and plank footbridge to get to his isolated cabin. Of course, the bridge you see today has been majorly reinforced. And the isolated cabin has turned into a popular attraction to visit. If you’re looking for a treetop canopy walk, this is the place to be. Another famous bridge in the U.S. is the Royal Gorge Bridge in Colorado. It used to be the world’s highest bridge until 2001. Flying high over the Arkansas River, there are 360-degree views worthy of a thousand snapshots. Vehicles can drive across, and you’re free to take a stroll along the 1260-foot suspension bridge, but only if you’re not afraid of heights! It’s not only a bridge for vehicles and pedestrians, but there are also adrenalin-filled activities nearby, such as zip lines and cable carts. Out of the famous bridges around the world, the Kintai Bridge in Japan has an old-world charm, dating back to 1673. The scenic location makes it a picture perfect spot to visit away from the hustle and bustle of Japan cities. The Nishiki River and mountains create an artistic backdrop to the castle and wooden bridge. Although floods have destroyed the bridge several times over the years, they keep reconstructing it. This is because it’s a significant landmark in the area and a popular tourist destination. If you need a bridge building in your community or on your property, where can you turn to? Bridge Brothers is an architectural firm that specializes in building bridges. Why not check out some of their designs? Which of these famous bridges will you add to your bucket list? Whichever bridge you visit, you’ll no doubt get your heart pumping at these immense heights. What else is on your bucket list? Click here for some cool travel ideas.